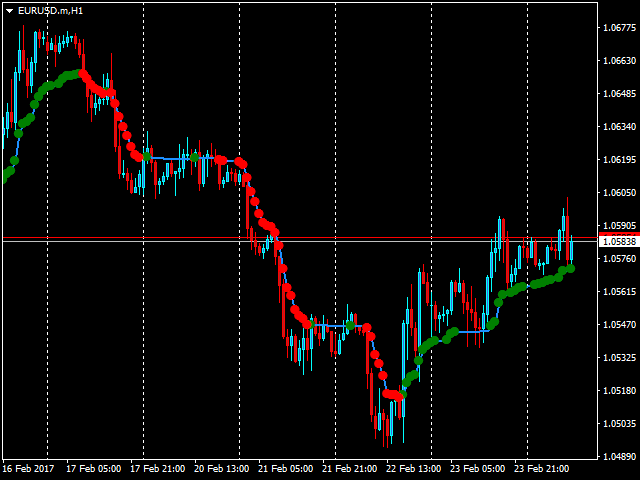 This indicator shows the tendency of the price and the change of the same confirming the change or the continuation with some points (yellow/blue). These points can be taken as inputs or to stay within the market if it is already inside. PeriodKAMA: Number of bars/periods of the MA (Moving Average). * Alpha represents a EMA (Exponential Moving Average). Fast Alpha (EMA) it is recommended that this should be for 2 periods, and Slow Alpha (EMA) to be 30 periods. These EMA's are used to calculate the volatility of the market and their values are taken into account to represent a AMA (Adaptive Moving Average). Updated and tested for MetaTrader 4 Version: 4.00 Build 1090 (19 May 2017). Updated and tested for MetaTrader 4 Version: 4.00 Build 1080 (12 May 2017). Update consensus with the rest of my products to version 2.5. Added new description and link to the comments on the web. Updated and tested (MetaTrader 4.00 Build 1065). Updated to and tested for the build 1031 (MT4).